Ras Al Khaimah: Jazirat Al Hamra or the Red Island, an important historical landmark in the emirate with forts and old buildings, has been restored and opened to the public. His Highness Shaikh Saud Bin Saqr Al Qasimi, Supreme Council Member and Ruler of Ras Al Khaimah, attended the festivities organised by the inhabitants of Jazirat Al Hamra to mark the revival of the old city after restoring several of its heritage buildings and sites. Shaikh Saud praised the initiatives of President His Highness Shaikh Khalifa Bin Zayed Al Nahyan to restore the sites and preserve the national heritage and rich history of the United Arab Emirates. The island had undergone a rigorous clean-up drive and a restoration programme as part of protecting its natural and historical identity. Shaikh Saud ordered lighting up the entire area to reflect its beauty and cultural heritage helping it become a tourism attraction with its forts and buildings steeped in history. Shaikh Saud also commended the voluntary initiative of four young men — Mohammad Rashid Al Zuabi, Mohammad Hilal Al Zuabi, Abdullah Yousuf Al Miyahi, and Hamad Esmail Al Ahmad — who inspired the clean-up drive by launching voluntary work. Their initiative was received positively by others, who made it a popular movement for cleaning and restoring 334 traditional buildings, including 11 mosques, 18 shops and two schools. As part of the initiative, the ancient narrow roads, or "sakik", were spruced up by removing the bushes that had grown because of a long period of neglect. The traditional houses and back gardens were also spruced up and weeds removed. Some ancient retail shops were decorated with traditional materials such as palm wicker and ancient lanterns. Shaikh Saud toured the old village and an exhibition of photographs of heritage sites and activities. Old fishing and diving tools were also on show. The men who inspired the movement said the initiative was intended to protect the old area from wasting away, as it had great historical value and needed to be restored. 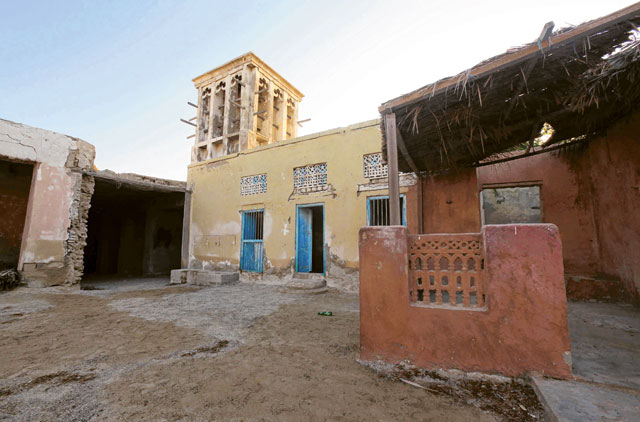 On its part, etisalat announced its support for the voluntary efforts aimed at reviving the historical site, which is located 18km to the southwest of Ras Al Khaimah city. The project also included the setting up and decoration of a traditional café in ancient décor, and the establishment of authentic traditional amenities reflecting the spirit of life in the past in the UAE. Jazirat Al Hamra, known as the Red Island, is a coastal town located 18km southwest of Ras Al Khaimah centre divided into the old and new towns. It is one of the oldest historical sites in the UAE. It is also known as the ‘ghost town' because of abandoned old houses and deserted narrow streets. Occupied by the Za'ab tribe, this coastal village was created in the 14th century on a peninsula. The villagers mostly subsisting on coastal fishery and pearl diving were also called Hadhr.